So I wrote a MacOS X screen saver, Fractal Clock. The next thing to do is make it available to the general public. Apple recommends distributing software using disk images. I could build the disk image using Disk Utility, but if I need to do so often, using Disk Utility will be tedious. And if I need to do so rarely, I'll forget the steps. Obviously I should automate the process. Since I'm using Xcode to build FractalClock.saver, I'm going to put the automation right in my FractalClock Xcode project. 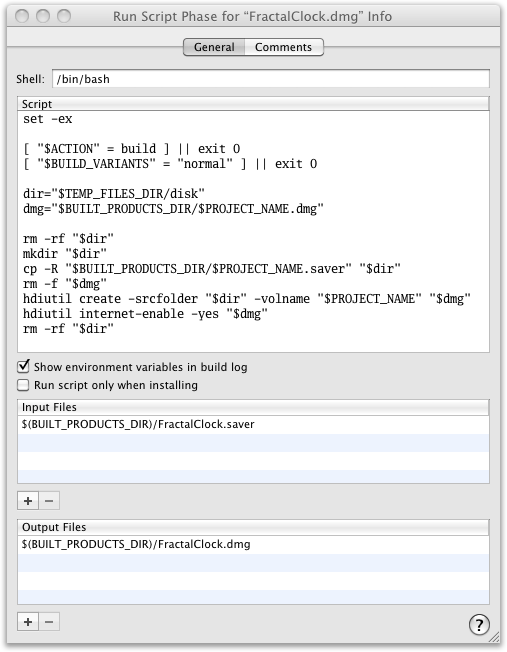 hdiutil create -srcfolder "$dir" -volname "$PROJECT_NAME" "$dmg"
Now I can build a disk image containing FractalClock.saver by right-clicking on the FractalClock.dmg target and choosing "Build FractalClock.dmg". The resulting disk image (found in the build/Release subdirectory) is Internet-enabled, so if I put it on the web and a visitor downloads it with Safari, Safari will automatically unpack FractalClock.saver and put the disk image in the Trash. url="$(svn info . | grep ^URL | sed 's/^URL: //')"
hdiutil create -srcfolder "$dir" -volname "$PROJECT_NAME-source" "$dmg"
I don't add any files to the Input Files or Output Files lists for the FractalClock-source.dmg Run Script phase. It's too much work to list all of the individual files that are its input, and if I list its output but not its input then Xcode won't know when it needs to be rebuilt. This way, it will just rebuild it from scratch whenever I right-click the target and choose Build. Now, when I right-click on the "Web Site" target and choosing "Build Web Site", Xcode builds both the application and source disk images, and copies them and the web files to my web site. What could be simpler?